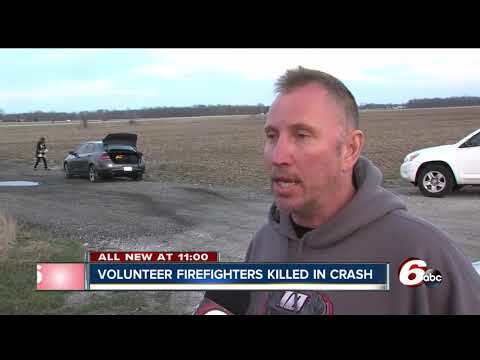 2 firefighters dead after planes collide at Marion, Indiana, airport. The Grant County coroner confirms that two people died in the incident, which was reported just after 5:00 p.m. Monday. The coroner says a plane taking off to the southeast clipped a larger plane that was landing from the north. The smaller plane crashed and caught fire, killing the pilot and passenger who were on board. The victims have been identified as Kyle Hibst and David Wittkamper, both 31 and from Elwood. They are both firefighters with the Pipe Creek Volunteer Fire Department. Emergency management officials say Hibst joined the fire department in 2011 and was also the EMS chief for the department. His wife is also a firefighter with Pipe Creek. Hibst is the father of a young boy. Wittkamper joined the department in 2007. His father and grandfather also served as members of the department. He is survived by his wife, Autumn. “The members of the Pipe Creek Fire Department are all at a loss as they come together to help each other through this difficult time,” officials said in a release. The FAA said the aircraft involved were a single-engine Cessna 150 and a Cessna 525 CitationJet. None of the five people in the larger plane were injured. Lines was driving by the airport when he saw the collision. “It was almost like he had pulled out into the larger runway a little bit too far and then when the bigger plane landed, his wing clipped it and it just kind flipped over and burst into flames,” he said. There is no air traffic control tower at the airport in Marion. Pilots are expected to communicate with each other about landings and take-offs over a common radio frequency. An airport official said the Cessna did that, but took off too soon. “There was not enough rise for the Cessna and he clipped the tail end of the (Citationjet),” said Marion Police Deputy Chief Stephen Dorsey. FAA investigators will be at the scene Monday evening. The National Transportation Safety Board has been notified of the crash and will be in charge of the investigation. The coroner says a cell phone was recovered in the wreckage containing text messages between the two victims. Just hours earlier, Hibst asked Wittkamper if he wanted to go flying, with Wittkamper asking what time they’d be home.